"Indian Idol 5" winner Sreeram Chandra, whose career graph seems to be touching new heights with his song finding a place in the Hollywood film "The Chronicles of Narnia: Voyage of the Dawn Treader", says he is reaping the benefits of his diligent work. 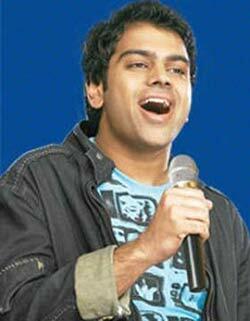 The title song of Sreeram's first album "Rehnuma" will be featured in the end credits of the Fox Star Studios film. "It feels really great that I am the first one to be singing for a Hollywood film and I will also feature in it. It's like a dream come true," Sreeram told IANS on phone from Mumbai. "The studio people heard me singing in 'Indian Idol 5' after which they approached me. I am happy that my hard work is finally paying off," he said. Titled "Rehnuma", the song will be used in the end credits of the Fox Star Studios film which is releasing Friday in India. The song has been recorded in three different languages Hindi, Tamil and Telugu. Hydreabad-based Sreeram is an engineer and doesn't belong to a musical family. As a struggling singer, he used to audition for regional reality shows, playback in small budget films and lend his voice for chorus, jingles and radio ads. His consistently melodious performances on "Indian Idol 5" made him popular among judges Sunidhi Chauhan, Annu Malek and Salim Merchant as well as various Bollywood celebrities. He was also the youngest singer to perform at the closing ceremony of the 19th Commonwealth Games in the capital alongside big names such as Sunidhi Chauhan, Shankar Mahadevan, Kailash Kher, Shaan, Ila Arun and Sufi singer Zila Khan. He says it was "an honour to perform with such big singers. These people represent India on the world stage." The 24-year-old admits the reality shows provide a platform for people to showcase their talent, but points out that it is up to them how intelligently they use it for their growth. "Reality shows are indeed a good platform for people to showcase their talent but after that it depends upon them how they make use of the platform. I have put in a lot of effort to reach where I am today. I still have a long way to go," he said. Sreeram has also got an opportunity to perform in countries outside India like Germany, Kuwait, Dubai, Bangkok and he is now looking forward to enthrall music lovers in South Africa and Bangladesh. "People in Berlin were very enthusiastic. I really enjoyed performing there. I have received a lot of messages from Pakistani people who liked my singing, especially when I sang 'Khwaja Mere Khwaja' (from 'Jodhaa-Akbar') on the show," said the singer who is popular in Pakistan. Despite singing so many songs, he still has cold feet before a performance. "I still feel nervous whenever I go on stage or record any song. I believe it's good to be nervous," he said. Apart from Hollywood venture, he also has some Tamil and Telugu movies in his kitty. After winning "Indian Idol 5", he took home a cash prize of Rs.5 million, a one-year contract with Sony BMG along with a golden chance to sing for Yash Raj Films. "I am still waiting for the offer to sing for Yash Raj," he said.